Vincent Price delivers a thrilling "tour-de-force" (Variety) performance as a small-time actor plotting big-time revenge...in inventively Shakespearean ways! Boasting a topnotch supporting cast, this dramatically "delicious concoction" (New York) delivers an "equal mixture of horror, comedy and Shakespeare [that'll] please just about everyone - critics included" (Boxoffice) and proves that all the world really is a stage...for MURDER! This movie was recommended to me by several people. And being a Vincent Price fan I been wanting to see it. But for some reason this movie has been in my collection for 2 years... and I just got around to watching it now. While I liked this movie... and glad I have it in my collection. I found parts of it to be a little too slow for my taste. I definitely wouldn't call it my favorite Vincent Price movie. 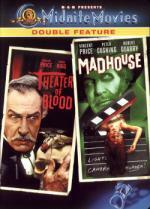 Though I do think every fan of Vincent Price must have it in his collection. Break out the bananas. Because here's a simian double bill to go ape over: The Gorilla and Nabonga. The Gorilla (1939) has everything a film buff could ask for. It's got the Ritz Brothers as detectives poking around in a creepy old house. It's got a guy (Art Miles) in a gorilla outfit. It's got both Bela Lugosi and Lionel Atwill! And, amazingly, it was made by 20th Century-Fox. Director Allan Dwan, who also gave us Frontier Marshall (1939) and Sands Of Iwo Jima (1949) keeps the silly proceedings moving as quickly as possible. Sam Newfield, who could crank out a B Western in two days , directed Nabonga (1944) for PRC. For the most part, it's King Kong with a little Sheena, Queen Of The Jungle and Tarzan thrown in for good measure. Singer Julie London (in her first film and before she married Jack Webb) plays a woman raised in the jungle by apes, Tarzan-style. The great B-movie cast includes Buster Crabbe (Buck Rogers) and Barton MacLane (The Mummy's Ghost, High Siera). Interestingly, Nabonga was also released under the titles Jungle Woman and Gorilla. The Gorilla however, was never called Nabonga. This movie was suggested to me by a friend today. It is mostly a comedy movie... but also mystery. Cool... I enjoy both genres... but why is this movie released in a classic horror collection? Just because Bela Lugosi has a small (well maybe medium) part in it? I don't see how this is in any way a horror movie. But with that said... I enjoyed this one. Laughed out loud on more then one occasion. Though most my laughing was do to the maid. The Ritz Brother is alright as a comedy team... but they are no Stooges or Abbott and Costello. The movie starts out a little on the slow side. But it does pick up steam a little into the movie. a fun little (only 1hr 6min) movie. was worth the time to watch it. Two women, one plan. We'll poison the creep who treats us like dirt, they agree. We'll dump the body in a murky pool, and someone will find a surprise at the bottom. There's a surprise, all right. When the pool is drained and cleaned, no body is found. 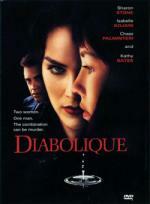 Sharon Stone and Isabelle Adjani pour on the femme and the fatale in a diabolical grabber of a suspense thriller directed by Jeremiah Chechik (Benny and Joon) and based in part on the classic 1955 French spellbinder Les Diaboliques. Will the women get away with bloody murder? Has someone removed the body of the victim (Chazz Palminteri) and begun playing mind games with them? Add to the mix a tough cookie of a detective (Kathy Bates) and you've got the ingredients for "a nail-biter from the first scene to the last" (Bob Polunsky, KENS-TV/San Antonio). This is one of the movies I got off our good friend Eric when he was selling off his movies. And I know I am going to get some flack for it... but once again I am watching a remake before the original. It is a good mystery thriller. I definitely enjoyed it. I am not familiar with this actress Isabelle Adjani... this is the only movie I have with her in it. But she is right good. I enjoyed her in it. Kathy Bates was pretty good in it as well... though I don't believe it is her best work. This is another one worth checking out. I am not familiar with this actress Isabelle Adjani... this is the only movie I have with her in it. But she is right good. I enjoyed her in it. Seven Doors Of Death is a film that will horrify, sicken and terrify those who dare to watch this tale. Set in Louisiana the movie opens in 1927 with a Satanic disciple being crucified and melted alive with quicklime in the basement of an old hotel. Fifty years later, Lisa (Kathrene MacColl) inherits the hotel, not suspecting that it is one of the seven gateways to Hell. Horrible events begin to happen in the possessed hotel, such as a workman breaking his neck, another has his eyeballs gouged out by a zombie, a woman's head is melted by a vat of acid and an architect has his face eaten by hungry tarantulas. Not a hotel to stay for the weekend! Great special effects highlights this not to be seen alone movie! This is one of the movies I bought blind for my October horror marathon when I found it cheap (only $1.91). After buying it I found out it is a cut version of the movie The Beyond... which I never seen either. But I will say... if this is the cut version... I need to get my hands on the uncut version. As this one had it's fair share of gore... I could only imagine how much is in the uncut version. It is a good movie... but it could have been better. In some places the script seemed a little off but that could be because this is because it is an Italian film. Some of the effects do look a bit dated but I think that is to be expected since this movie is 28 years old now. And why did there just have to be a scene with spiders? I HATE SPIDERS! I had chills going up my spine during that scene. But over0all is a right good story. Hopefully before too long I can get my hands on an uncut copy. During the start of World War II, a female guest to the home of a high-ranking British official appears to have an ulterior motive for her visit. Going through my unwatched collection I found this war movie in a cheap boxset I got called Combat Pack. It has 20 movies on 4 DVDs. 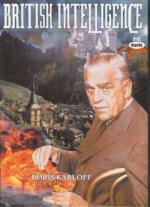 This one caught my eye as it has Boris Karloff in it. As I have enjoyed everything I have seen him in before I though I would give this one a chance. I never really been a huge war fan (my mother was the war fan in our family)... so the fact that this movie is only an hour long helped as well. I must admit... this one surprised me. First with the quality of the release. Both the audio and video was in very good shape... especially considering the cheap Mill Creek set I have. No problems at all with the audio... and only a few spots of dust on the video. At least on my standard 20in TV. Then there was the movie itself. I found myself quickly getting into the storyline. It is a very good story and the cast did well. I especially enjoyed both Boris Karloff and Margaret Lindsay in this movie. It turns out this is the only movie I have with Margaret Lindsay in it. Though I do see she has done a lot according to imdb. I may have to look into checking out more of her movies. I liked the fact that this movie was more about spies during the war instead of the war itself. So I got myself a nice surprise in this one. It is definitely worth checking out.